It's a phrase you might expect from your girlfriend or husband. But according to this YouTube video posted by birdsiviewnc in 2011, humans aren't the only species who seek affections from their loved ones. JoJo, an Indian ringneck, sits on a raised wooden platform next to Buddy, a Quaker parrot, at the Birds-I-View Parrot Rescue in Charlotte, N.C. JoJo, with his neon face and pink beak, looks at Buddy and asks, "what ya doing?" Buddy seems more interested in a pair of blue-and-yellow macaws on the ground below. 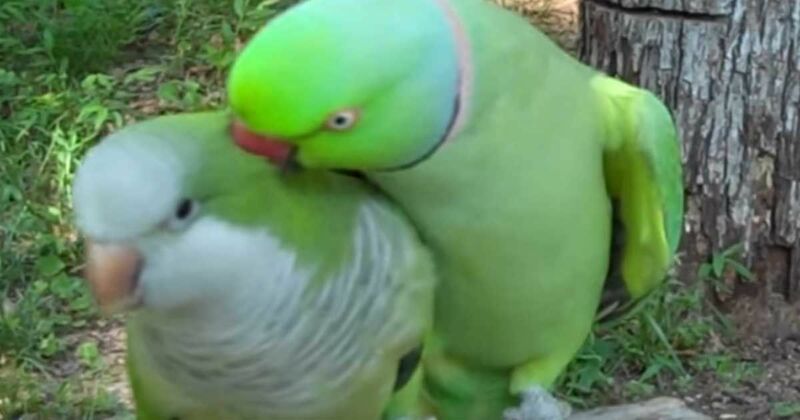 When Buddy doesn't respond to JoJo, the bird turns tenderly to his friend and says, "give me a kiss," before proceeding to actually kiss Buddy. He repeats the action and request, while making smooching sounds. Buddy responds by shaking his head up and down, and eventually gives in to satisfy JoJo with a kiss. According to the birdsiviewnc YouTube channel, JoJo and Buddy bonded as baby birds and have been partners ever since. You can see several other adorable videos of the bird couple on the birdsiviewnc YouTube channel and Facebook page. IndianRingneck.com explains birds like JoJo are native to Asia and Africa, and are intelligent animals that make great pets. They are known to show off, making it no surprise JoJo is always trying to impress Buddy with his mastery of talking, another characteristic known of Indian ringnecks. Buddy can surely compete with his Indian ringneck partner, though. According to QuakerParrots.com, Quaker parakeets like Buddy are experts at imitating sound and human speech. They are known to entertain themselves for hours practicing chirps, whistles and vocalizations. Together, JoJo and Buddy make one of the cutest couples the Internet has seen in a while. Check out the clip below and let us know what you think in the comments. When you're finished watching, be sure to share it with your friends on Facebook.